Did you make that Mark!? so creative to go at it from the bottom. Love it, it matches his costume too. Was he sad to see his playtoy get cut up?? I agree with Aunt Juj. If you carved it, Mark, it’s terrific and creative. And Henry looks fascinated. Years ago when John Mark & I lived on a cul de sac in Houston, we had Halloween block parties and prizes for the best jack-o-lantern. This one would have won our 1st prize “Champion Carver” cape which we passed along every year to the new winner. Thanks for the compliments, Mom and Juj. It’s a pretty basic jack o’ lantern. The only real frills are the horns that are affixed with toothpicks. 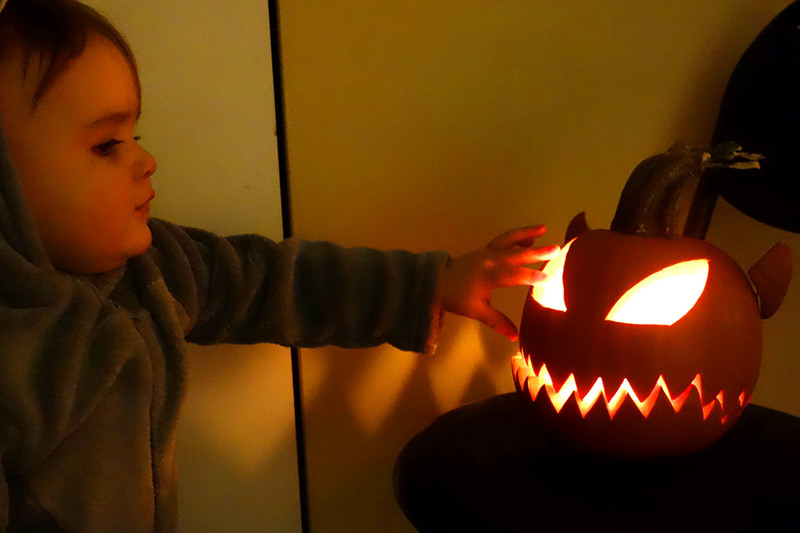 Henry was pretty entertained by it when I moved its “jaw” to make it talk and of course when it was lit, as you can see.